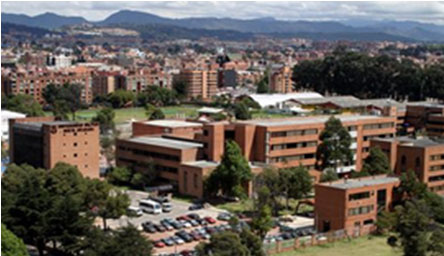 UNIVERSIDAD MILITAR NUEVA GRANADA, is a public educational institution founded in 1982 and based in the city of Bogota, Colombia. The University has 8 faculties, 20 undergraduate and 66 graduate programs, 9 master's degrees, 44 Diplomas and 52 Research Programs. The Institution has been accredited with the ISO 9001:2008 and NTC GP 1000:2004 Quality Management Certifications. UNIVERSIDAD MILITAR NUEVA GRANADA is a national public institution specialized in the formation of qualified professionals. The Institution aims at promoting dialogue, an interaction of knowledge, building an academic community. It is committed to forming responsible citizens and individuals, promoting justice, equity, respect for human values and contributing to the progress of the defense sector and the society in general. 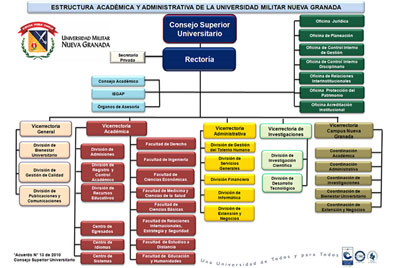 UNIVERSIDAD MILITAR NUEVA GRANADA aims to be recognized nationally and internationally for its high quality programs, encouraging creativity, continuous learning, research and innovation and ensuring the development of integral solutions that meet the needs of society and the defense sector as well. UNIVERSIDAD MILITAR NUEVA GRANADA is a center of higher education with a focus on scientific and technological development. It is dedicated to outfitting its students with the medical, technical, social and systematic skills that are essential in professional life. Enhance connections with the defense industry. Cra 11 No 101-80 Bogota, Colombia. Administration of Occupational Safety and Health. UNIVERSIDAD MILITAR NUEVA GRANADA has developed research and development centers for promoting and coordinating research and technology development within the faculties, formulating problems of interest, drawing strategic plans and producing results on a subject.